So my little girls stayed up late watching rented movies, trying to bring in the New Year. I don't know if they made it; I know I didn't. But since I got up sooner and this is what they all look like this morning around 9 am, I figure they must have gotten close because they normally get up at 5 am. 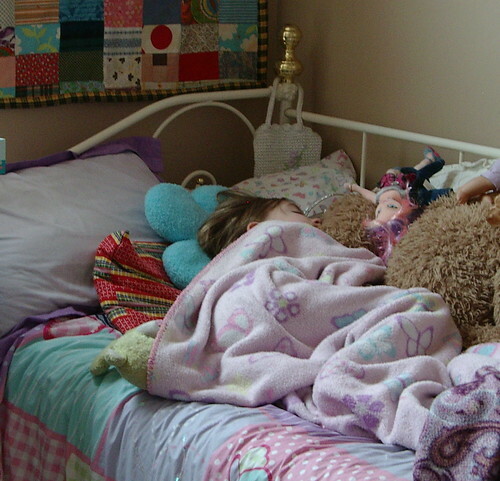 This is butterfly girl sleeping with this year's Christmas doll and a teddy bear from a few Christmases back. This day bed was given to me when I was 16 years old as a birthday present. It used to have a trundle under it, but I gave it away at the age of 20 to a family who needed a bed for their toddler. Some day I will make it have a trundle again. The quilt on the wall was a Christmas gift my older sister received when she was about 7 years old, a prized possession of my youngest daughter who got it as a gift a few years back from my sister. Lady bug girl sleeping with this year's toys, too; neither of them look like they had the energy to actually get under their bedding. I half expected them to all be asleep on the floor in front of the TV with it on. This bed is part of a set that belonged to my Great, Great Aunt TC; the set has two night stands and a dresser and two twin beds, about 90 years old. This bed is a prized possession of mine because I don't have much (possession-wise) from my Great, Great Aunt TC which is sad because I played at her house almost every weekend of my youth. Fairy girl asleep in her primary colored bunk bed, sort of under her finished quilt with this year's new toys and last year's bear. 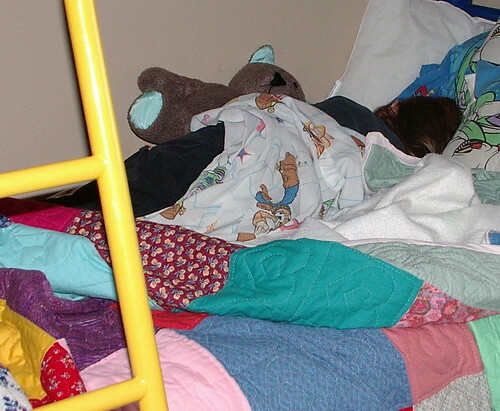 Also a sleep under her Toy Story sheets, one of her favorite movies from the time she was 1 'till about 6 years old. She has probably out grown them, but they are sentimental to her now, and I think she would get real mad if I got rid of them unless I replaced them with tinker bell or some other fairy-themed item. This bunk bed was purchased when I was pregnant with our third child. At different points in my children's and my life, every family member has had this as their bed, including my husband and myself when we lived with my in-laws for a year. If you can believe it, we (my husband and myself) slept end to end on this bed for about 9 months. Fun how all the beds have some sort of story. I hope you all have a great new year with plenty of rest. Looks like your girls are all partied out! 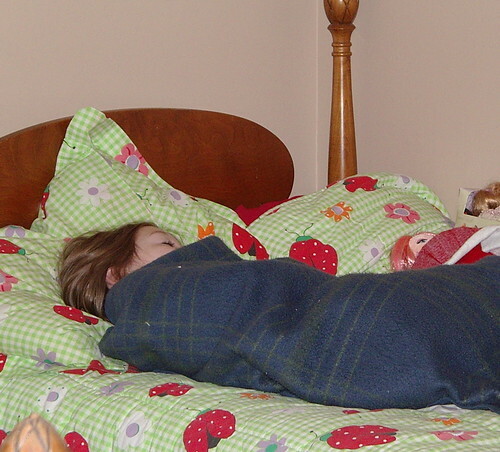 Thanks for sharing the pictures of them - there's nothing sweeter than a sleeping child! They look so precious.